Pottersville, of course, was the darkest timeline of Frank Capra’s capricious, Christmastime fable “It’s a Wonderful Life”, the alternative to the homey, idealized Bedford Falls where George Bailey realizes he has belonged all along. 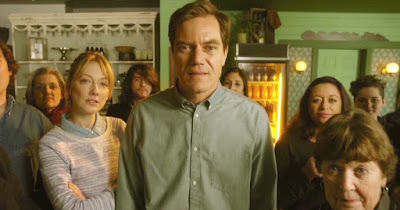 That moniker would seem to suggest “Pottersville” director Seth Henrikson sought to render his own sentimentalized parable, one in which shopkeeper Maynard Greiger (Michael Shannon) inadvertently sparks a Bigfoot crisis in his hometown and then deliberately furthers it from the goodness of his heart. But then, as that premise suggests, “Pottersville” requires a steady hand at the wheel, one to choose Straight Face or Winking Face Emoji and stick with it. Henrikson, however, not only pogoes between the two, he trucks in slapstack that would be better with a laugh track while also taking a few stabs at satire that falls flat because it is overrun by the film’s deafeningly on the nose musical score. The whole movie is scored like that scene in “Ferris Bueller’s Day Off” where Edward R. Rooney is wearing his flip-up sunglasses. As such, “Pottersville” devolves into what we like to call a Tonal Nuclear Reactor Meltdown, which is worsened by a screenplay that beyond its broader brushes of absurdity is so rote my friend Jaime suggested it had been spit out by an A.I., never mind that its tragically overqualified cast, all of whom seem to have been given differing directions about what movie they were in, are left to stand there helplessly on screen amidst so much metaphorical radioactive sludge. This Pottersville is on its last breath, at least as evinced by the opening montage of innumerable homes with For Sale signs. This might be a nod to the recent economic crisis, but it also might just be that sort of timeless narrative spark, and Pottersville does seem to aim for timelessness, with its rotary phones and apparent absence of the Internet, where everyone still gathers to watch local news. These hard times are supposed to have hit Maynard too, though his home, when glimpsed, bears no sign of it nor does his general store, which comes off quite well despite the fact that he apparently extends credit to everyone. No, if something is rotten in Pottersville, it is communicated more in the strange chartreuse color schemes giving the general store an eerie glow, as well as looming close-ups, in which Shannon often finds himself, hinting at noir, though Shannon, who has played noir, plays Maynard with less fatalistic menace than mannerly reserve, even, for the most part, when he gets drunk and puts on a gorilla suit. This is what elicits the Bigfoot craze, with people mistaking Maynard for a sasquatch, and within 24 hours, or maybe longer, because real time is irrelevant in Pottersville, hordes have descended on the town, including a TV cryptozoologist, Brock Masterson, played by Thomas Lennon with a phony Australian accent in the broad comedy portion of “Pottersville” as he becomes ensnared in a scheme roping in ruff local Bart (Ian McShane). This turn toward comedy is also evoked in an emergent subplot chronicling the Furry Lifestyle which is what puts Maynard’s relationship with his wife (Christina Hendricks) on ice and gets him into that Gorilla suit in the first place. But Henrikson evokes Furries with alternating comic contempt and empathy, never deciding, which merely produces I-Can-Hardly-Watch-This peculiarity, making one wish for Zach Clark’s impressively delicate rendering of suburban swingers in the superior “White Reindeer”, which this movie might have been with any thought or touch. Oddly, “Pottersville” might have benefited from a less qualified cast, going “The Room” route with a gaggle of amateurs trying really hard who could have potentially extracted the So Bad It’s Good air begging to be let out. The only one picking up on that vibe is Ian McShane, who at one moment randomly twists the name “MAY-nerd” into “May-NARD” because why not? He’s just Ian McShane really, but that’s okay, because he’s here to be him rather than whoever the hell the script said he should be. That’s what left me with the impression that Michael Shannon, as much as I love him, and as nobly as he tries here, was the wrong man for the leading role. “Pottersville”, I think, needed a Nicolas Cage.